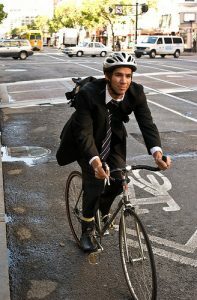 If you use a bicycle when commuting, please register with the TMA by completing our registration form. As a TMA registered cyclist you can enjoy free membership in the Emergency Ride Home Program. You will also benefit by receiving notices on any upcoming bicycle education classes and get the opportunity to collaborate on many of our bike related projects and advocacy. To register you must work in Hudson County or park your bike at a transit hub in Hudson and then complete the trip by mass transit. Be sure to take advantage of our free Adult Smart Cycling Class classes so you can learn more about the rules of the road and driving safely in an urban setting. Reduces air pollution — bicyclist emit few poisonous gases. A four mile bicycle trip keeps about 15 pounds of pollutants out of the air we breathe. Reduces water pollution — bikes don’t drip brake fluid, anti-freeze, transmission fluid, toxic dust, etc.